This week has been ‘hard’. By ‘hard’ I mean that my normal ‘work’ has been supplemented by even more events than usual, culminating in the 2-day fungasm (fungasm might be going too far, I will admit) that was Whisky Live London 2011. I was at there under the auspices of work and I have at least one blog post bubbling in the back of my brain to be decanted onto the TWE blog, but I also did Other Things around the time which seem to fit better over here. First up – a preview tasting of whiskies with the folks from the Scotch Malt Whisky Society. In the last couple of years the SMWS have been upping their public exposure, starting with an occasional open evening during the Edinburgh festival and now running regular public nights and actively recruiting members. Part of this is their arrival at whisky shows, with stands at every major UK show in the last year, including this year’s Whisky Live London. As with last year’s Whisky Show they decided to invite a few favoured souls along to an evening of meat and whisky beforehand to preview some of the drams they were taking along, and yet again I managed to get on to the guest list. As with last time the plan was quite simple – assemble in Bistro du Vin Clerkenwell‘s Whisky Snuggle (still maybe the most stupid name for a room I’ve ever heard), drink whisky and eat things that were once part of a cow. 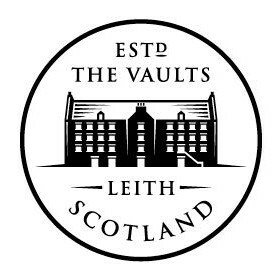 Bistro du Vin, part of the Hotel du Vin/Malmaison group, are partnered up with the SMWS to provide guests/diners who are members of The Society the chance to have a few drams, and have a range of whiskies and space set aside in some of their locations. Hence the Whisky Snuggle. That name really does make me twitch. We started off, as is tradition, with a lowland whisky, 25.62 – Classy and Attractive, a 20 year old from Rosebank, closed since 1983 and since converted into a Beefeater restaurant. On the nose it had honeysuckle, light honey, sugared almonds, turkish delight, porridge, lime zest and a hint of dustiness. To taste it had creamy citrus – the middle of lime cream chocolates – dusty oak, parma violets, lemons, and a touch of smoky wood and cedar lined cigar boxes. It finished sweet and fruity, with juicy strawberry appearing as it faded. Dram number two was 104.13 – An Angel Fallen to Earth from Glen Craig. Glen Craig isn’t actually a distillery, it’s the name given to spirit distilled at Glenburgie in the 1970s using Lomond stills. These are stills with a regular pot still at the bottom but with adjustable plates in the neck and a moveable lyne arm to allow the distiller to modify the character of the spirit. Hiram Walker, owners of the distillery at the time, installed a pair of Lomond stills so as to be able to produce a wider range of spirits to satisfy the demands of the blending industry. However, they the blenders preferred their regular whisky and they removed the stills in 1981. Since then the SWA have declared that Single Malt Scotch Whisky has to be produced using a regular pot still without any spangly attachments, meaning that not much Lomond distilled whisky is produced these days other than at Loch Lomond distillery, who lend their name to the still type. Anyways, the whisky is increasingly rare these days and I’d not managed to try one from the distillery before. On the nose it had rosewater turkish delight, digestive biscuit crumb crusted lemon tarts, milky cornflakes and dusty wood. To taste it was oily, with cream, parma violets, sour oak and some polished wood. It finished slightly astringently, with cloves and dry oak. We took a break after the first couple of drams to go and meet the chef and our dinner. Hotel du Vin dry age their meat on site in a special freezer and in order to get the best out of the process they buy slow grown British beef. It’s some of the best beef they can get without turning to ridiculously priced imports (USDA prime beef is incredible, but scarily expensive due to the roundabout route it takes to get to the British market) and comes from Lake District Farmers. 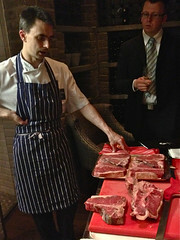 They use 29 month old beef, as after that it is illegal to sell the meat on the bone, and then age it on the bone for between 2 weeks (for fillet) and 4 weeks (for rib and sirloin). It’s dry aging, leading to a large amount of waste as not only does the meat contract as it loses moisture (and thus size and weight) but also picks up fungus, which aids in the aging process but needs to be trimmed. 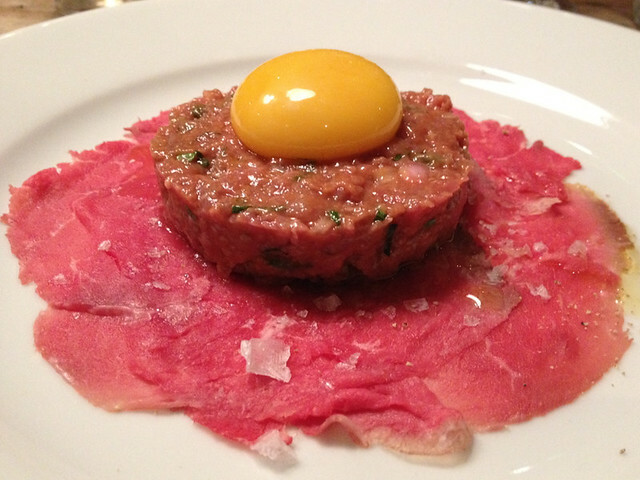 We had a few beefy bits to eat over the space of the evening, starting with a carpaccio (taken from the rump) topped with a fillet steak tartare. This was followed up with a main course of porterhouse steak – an American cut T-bone from the rump end, giving a larger fillet piece than the traditional British version. The Clerkenwell branch of Bistro du Vin has been open for about a year now and they’ve settled in well – the steaks are well cooked, the meat is tasty and other than their portions of chips being too large for my tiny appetite (ahem) it was all good. Next dram on the list was 121.50 – Xmas cake and Afghan Coats, a 9 year old sherry monster from Arran. When I first joined the society I’d pick up every Arran bottling untasted but after a couple of less than stellar whiskies I’ve dropped back to trying every one before I consider buying them – I’ve not bought one in a while. On the nose this was filthy, with dirty engine oil and diesel (I’ve never smelled two-stroke, but this is what I imagine it’s like), Vicks, cherry menthol and rich raisiny wood. To taste it was pure big dirty sherry, with a decent amount of struck match sulphur, and the Christmas cake of the name studded with black liquorice, leather, dark chocolate and burned wood. It finished long, with big woody spice and sweet raisins hanging around and slowly turning bitter. One for sherry heads and a bit much for me at a full strength of 61.3%. We then moved on to 93.50 – Hot Embers at the Gates of Hell, a lightly coloured dram from Glen Scotia, Campbeltown’s ‘other’ distillery. 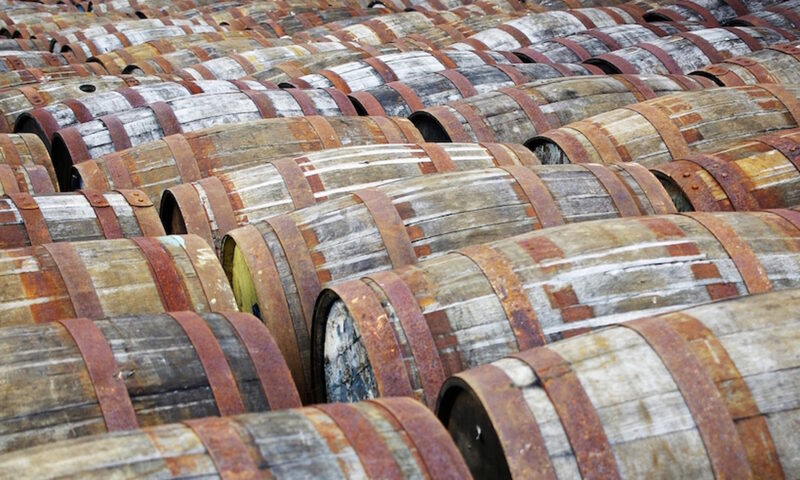 While Campbeltown used to be the centre of the whisky industry back at the turn of the 20th century it’s now been reduced to a couple of distillers, with most of the focus being on Springbank (along with the Longrow, Hazelburn and Kilkerran they also produce). I’ve tried a few society Glen Scotias and none of them have really stuck in my memory. This one had a big smoky nose, metallic and pungent like emptied briny fish tins. After my nose got used to the kick from that I found some caramel sweetness and a bit of smoky lime hiding underneath. To taste it started with sweet citrus and aniseed, before being quickly swamped by hammy smoke. The finish was heavy with minerals, gravelly and dry, sweetened up with some spicy aniseed balls. Again, a bit much for my liking, definitely needing water (which I didn’t get round to adding) and not as complex neat as I’d hoped. We took another break at this point to try a bit of cheese and some dessert. The 93.50 was a bit much for the Brezain that I nibbled on, as being a cheese wuss meant the Bleu de Gex also on the cheeseboard was a step too far for me, but the 121.50 worked well, cutting through the fat of the cheese without swamping its delicate nutty and smoky flavour. The 121.50 was also the winner when it came to dessert, with chocolate sorbet, chocolate pavé and honeycomb rather well complimented by the dark fruit and sherry wood. The ‘official’ last dram of the night was something I was rather impressed by, 29.109 – Oak and Smoke Intensity, a 20 year old very sherried Laphroaig. While you get some sherry in most Laphroaig expressions I’ve not tried a fully sherry matured one, let alone one as dark and heavily influenced as this one. On the nose there was pungent extra strong cherry Strepsils, a crisp mineral smoke, damp forest floors, some sugary sweetness and very dark chocolate. To taste it was rich and spicy, with the predictable raisins, leather and cocoa joined by cracked black pepper and smoky charcoal dust. It finished long, with a burnt oak chip smokiness, smoked cheese and fruity dark chocolate. Over the top and rather impressive, one that I may have to investigate acquiring, although it not being on their website implies I might be too late. Helen, who invited me along for the evening, wasn’t going to let us finish with that whisky, chosen by SMWS London rooms manager Joe, and had brought another one along to rival it, 33.something – an Ardbeg whose name and number I didn’t catch…we had been drinking for a while by then (Update: Helen just mailed me to let me know that it was 33.115 – Man that’s braw, which she translates as “Squire, I do believe this to be a very good dram indeed”). It was lightly coloured and quite a contrast to the previous dram – a nose of smoky menthol, gooseberries, sweet lemons and raisins, with tropical fruit hiding underneath all the rest. To taste it was big and gravelly, with loads of smoke overpowering the rest of the flavours, although a little bit of citrus fruit poked its head round the corner. An interesting one this, although again a bit much for me (I think my recent sticking to 40-46% whisky has killed my ability to drink cask strength), a sherry cask matured whisky (although almost certainly 2nd or 3rd fill) without much sherry to it, letting the spirit’s character (which Ardbeg has in spades) come through rather than being swamped by the cask. Anyways, many thanks to Helen, Joe and John for hosting the evening and the folks at Bistro du Vin for filling me with steak. Alwynne of Miss Whisky has also written up the evening, as has Tim Chester of thirtyoneseventyfive. Campbeltown Single Malt Scotch Whisky, 58.6%. Islay Single Malt Scotch Whisky, 59.2%. Islay Single Malt Scotch Whisky, 55.4%.